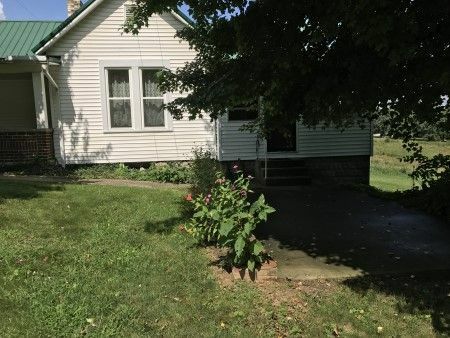 7.7 Acres * Clean 6 Room Home * 4 Car Garage * $25,000 Minimum Bid! What a beautiful property with a nice clean home situated high on the ridge along the road viewing the pasture below. Home offers front covered porch, combo living and sitting room, 2 bedrooms with closets, eat-in kitchen with cabinetry, bonus room with washer/dryer hookups, full bath with shower; and the enclosed rear porch with knotty pine walls is a great place to relax and enjoy your favorite beverage while viewing the pasture and wildlife! 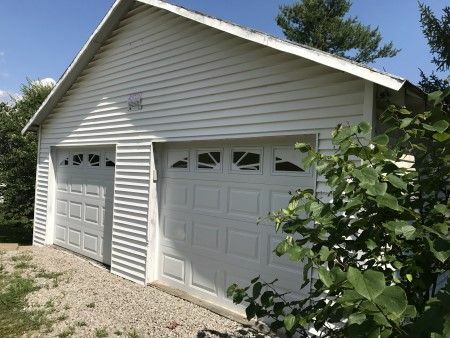 The walk-out style basement offers concrete floors, shower over tub, utility sink and the home is equipped with county water, LP gas furnace & 200 amp breaker box. Home also offers a lot replacement windows. The 4 car bank barn style garage offers two overhead doors with openers & storage space. Also the property has garden space and two chicken houses with mature pines and hardwood trees on the ridge with the meadow below. Real Estate Terms: $25,000 Minimum Bid; $5,000 down at time of sale in cash or check; balance & possession upon delivery of deed at closing on/before Nov. 29, 2017; offered free & clear prior to closing; sold in As-Is condition; no Buyer's contingencies exist; taxes pro-rated to closing. Taxes & Legal: Jackson Co. Auditor reports Net Annual Taxes are $886.44 (Homestead Reduction included); Auditor's Appraised Value: $90,030. Property identified as Parcel No. M240330005600 & M240330005700; Eldon Pittenger Trust, Roger T. Whitaker, Successor Trustee.